Color Line Stadion is an association football stadium in Alesund and is also the home of the Norwegian Premier League side Aalesunds FK. Built at a cost of NOK 160 million, Color Line Stadion is the first top-level stadium to feature an artificial turf. If you are a football fan visiting Alesund then you have to definitely visit Color Line Stadion to understand the Norweigan's love for football. During the home matches, the atmosphere is highly vocal and the experience is totally unique. Contact the management for information regarding the ticket prices. For info on the programs, reach out to the management. Love this? Explore the entire list of places to visit in Alesund before you plan your trip. Fancy a good night's sleep after a tiring day? Check out where to stay in Alesund and book an accommodation of your choice. How popular is Color Line Stadium? People normally club together Hiking Trip To Sukkertoppen - The Sugar Top (314 M) and Alesund Harbor while planning their visit to Color Line Stadium. Best stadium in the world. Not biased at all since i live here and heavily support the home team. A lot of toilets, each kiosk supports a local team and the VIP lounge is as expected. Went to a concert over there. Great arrangement. 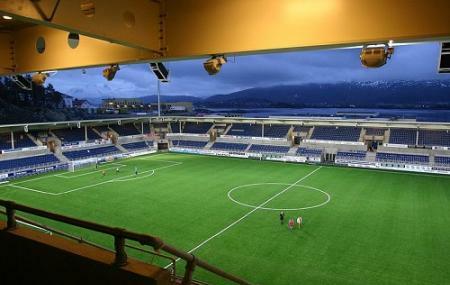 The home stadium of the local football team Aafk. Very beautiful stadium and the supporters are awsome!